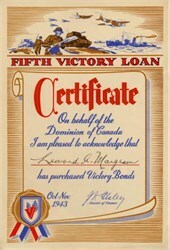 Issued certificate from the Fifth Victory Loan dated 1943. This historic document has an ornate border around it with a vignette of men fighting a war. This item is over 65 years old.